I’m sure you would have heard of Micro:bit and even used them in your STEM class for teaching hands-on electronics and programming. 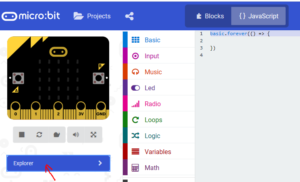 Did you ever run out of functional blocks that you would require to do a specific task or computation using Micro:bit? Have you ever dreamt of having your custom function readily available as a block? Relax! this tutorial is, then, especially meant for you. The “Explorer” menu expands down to show additional items. There is a “+” button next to “Explorer” now which is meant for adding custom blocks. Click the “+” button. A confirmation window pops-up. Click on “Go ahead!” to add custom blocks. Either you can develop your own code for a custom function or copy-paste the following piece of code to create a new block that plots any number between 0 – 25 using LEDs (i.e., 1 led per number). Here is a video demonstration of a custom function that plots a graph on 5×5 LED Matrix for any number between 0-25. * Use this file to define custom functions and blocks.